The drearily serious "Arrival" has some suitably awe-inspiring giant-hovering-spacecraft shots and emotionally wrenching moments, but it's ultimately kind of dumb for a movie that tries to look so smart. Amy Adams stars as Dr. Louise Banks, a languages professor haunted by thoughts of her dead daughter that are underscored by composer Max Richter's moving "On the Nature of Daylight" (heard previously in "Shutter Island," and sad enough to make just about any footage of anything bring tears). A door in the bottom of the otherwise featureless ship that's suspended over Montana opens every 18 hours, allowing Banks, Donnelly, a canary and some soldiers manning recording gear inside for an unspecified interval. What's never addressed is how long that interval is, or exactly how the aliens indicate that anyone inside should leave, which would have to involve some sort of communication. Also, while the canary apparently is supposed to be a coal mine throwback, its presence begs the question of how other-worlders might regard a species barbaric enough to use a bird in a cage as a "see if it falls over dead" atmosphere tester. This is something you would think might occur to at least one person on the first-contact ground teams, but apparently not. The creepy aliens, which resemble huge elephant-skinned octopuses with one fewer leg, float in a foggy mist behind a transparent wall inside the ship. They communicate with what look like splotchy coffee rings that they "ink" onto the wall. Banks tries teaching them English in the most unbelievably slow and inefficient way imaginable, starting out by writing the word "human" on a board and pointing to herself. Considering that these aliens are able to selectively control gravity, most likely have mastered faster-than-light travel and therefore probably have more brains than an inarticulate toddler, they presumably could handle a lesson more academically advanced than the equivalent of "me Tarzan, you Jane." It's also hard to believe that the task of finding a way to converse with the newcomers wouldn't involve a lot more technology (if not with a laptop displaying Google Translate, then at least a screen flipping through a picture dictionary). Plus it's hard to buy that such an important mission would be entrusted to only two people who get in-person facetime with the aliens in America, especially since one of those people doesn't do much of anything except watch the other's earnestly well-meaning efforts. Without spoiling any specifics, the eventual reveal about the aliens' intentions raises an intriguing philosophical point. But the climax hinges on the very hard to swallow unlikelihood that the aliens would need to possess universal mind-reading omniscience to know something they pass along to Banks. Also, despite an admonition that the answer to why the aliens are here has to involve all 12 first-contact teams working together around the world, that's clearly not what happens. Director Denis Villeneuve ("Enemy," "Sicario") gives the proceedings a nearly humorless gravitas that frankly gets a bit dull, although the alien encounter bits are suitably unsettling. 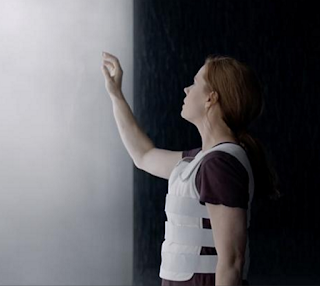 If the screenplay by Eric Heisserer (adapted from the short story "Story of Your Life" by Ted Chiang) had shown a little more thought, "Arrival" may have been as intellectually satisfying as it is sentimentally touching.